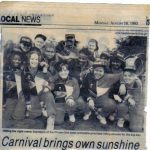 The band was founded in 1978 by Victor Phillip, originally under the name Broad Heath School Steel Band, but so many children from other schools wanted to join that the band had to change its name to something less exclusive; and so Phase One was born! The band enjoyed many successes, with a tour to Hamburg, Germany and many gigs up and down the country. After a few years the band was invited to Keele in Germany, which is twinned with Coventry. 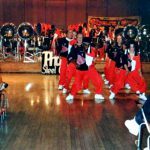 The band went to Hong Kong in 1984 representing Coventry and introduced the Cantonese people to steel pans, which for many, was the first time they had ever seen such an instrument. Phase One were invited to take part in the very first episode of Emu’s World, a very popular children’s programme in the 80’s. Another popular children’s programme the band appeared on, was Going Live. Phase One has also taken part in several Children in Need broadcasts. In the late 80’s a very popular band of the time was a group called A-Ha. Phase One was booked to greet them on the platform of Birmingham International train station, playing some of their most popular hits. A-Ha were so impressed, they immedia tely asked Phase One to perform that very night, at their concert at the NEC in front of thousands of screaming fans. 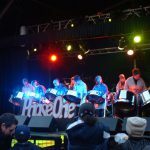 Phase One has played at many festivals and competitions in their 30 year history. 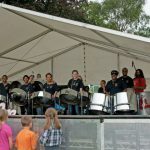 In the beginning steel pan festivals were held in the Commonwealth Institute and then at Warwick University Arts Centre where steel bands from all over the country used to meet and share music. Phase One decided to enter the Panorama competition in London in 1987 for the first time. It was a great achievement for Phase One to even participate, and to everyone’s great surprise Phase One won the competition outright. 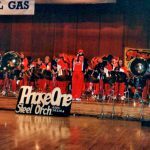 In 2007 Phase One teamed up with members of Steel Pan Academy and went on the first of a series of tours. The first to Barcelona. The tour was a big success with every performance seeing many local people coming out to listen to the bands. As well as this being a musical tour, with great locations for the performances, it was also an enjoyable holiday for the band members who had worked so hard to raise the money to go in the first place. In 2009 Phase One and Steel Pan Academy went on tour to Paris. Where the bands played at Disney Land Paris as well as in the Jardin du Luxembourg. 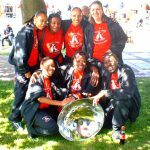 In 2011, Phase One and Steel Pan Academy travelled to Lake Garda, Italy and performed in squares in many of the surrounding towns and villages. Most recently, Phase One and Steel Pan Academy toured to Belgium in July 2014. Here the bands performed at the prestigious Ghent Festival on the main stage in Sint Baaf’s Square, Ostend and De Panne. Check out our Photo gallery for pictures from all of the tours! The band has now moved in a more educational direction. Many of the band members are full time Pan teachers in schools in Coventry, Birmingham, Warwickshire, Leamington, Rugby and Nuneaton. Phase One is a working band – consistently in demand, especially at peak times of the year (May – September). Phase One’s future plans is to record a new CD and to attend an international music festival. Phase One will be moving premises and consolidating all their activities under one roof. This will include their Training school, workshop and band practice room.